This Cygnus spacecraft was named “Gene Cernan” after the astronaut who passed away in January 2017. The advanced version of the Cygnus that came into service in December 2015 has now been widely tested so it can make the most of its higher capacity and its more advanced systems. For its previous refueling mission, Orbital ATK resorted to the Atlas V carrier rocket, this time it returned to its own Antares in the version introduced in October 2016. The Cygnus spacecraft carries a total of 3,350 kg (7,385 lbs.) of cargo, including 1,243 kg (2,740 lbs.) of various types of supplies for the crew, 932 kg (2,055 lbs.) of hardware and the rest in equipment and various components. 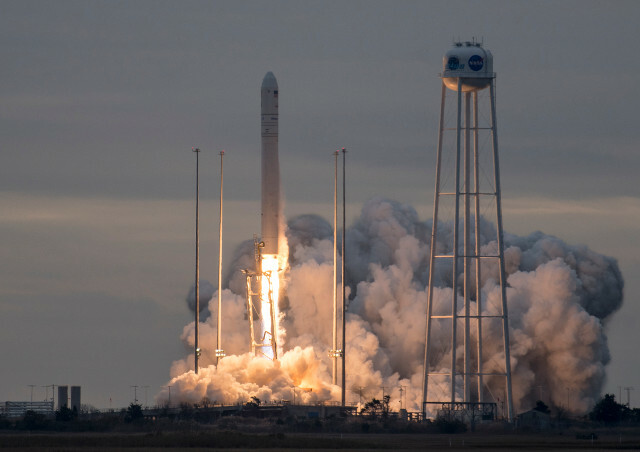 The cargo includes various CubeSat-class nanosatellites and experiments needed for some of the scientific research carried out on the International Space Station. Among the experiments trasnported on the Cygnus there are several concerning biological and medical research such as the E. coli AntiMicrobial Satellite (EcAMSat), which aims to investigate the effects of microgravity on the bacterial antibiotic resistance of bacteria from the E. coli family responsible for urinary infections in various species, including humans. In recent years, NASA has been developing a laser communication system and some CubeSats were equipped with that kind of system as well within the Optical Communications and Sensor Demonstration (OCSD) project. They will be used to test this kind of communication on small satellites that need very compact systems. Another type of CubeSat that will be used to test communication systems, this time via radio through a reflectarray, is the Integrated Solar Array and Reflectarray Antenna (ISARA). The Cygnus spacecraft is scheduled to reach the International Space Station next Tuesday to be captured by the Robot Arm Canadarm2 around 10:40 am UTC. If there’s no problem, the day after the arrival of the Cygnus the crew will open its hatch and begin its unloading.